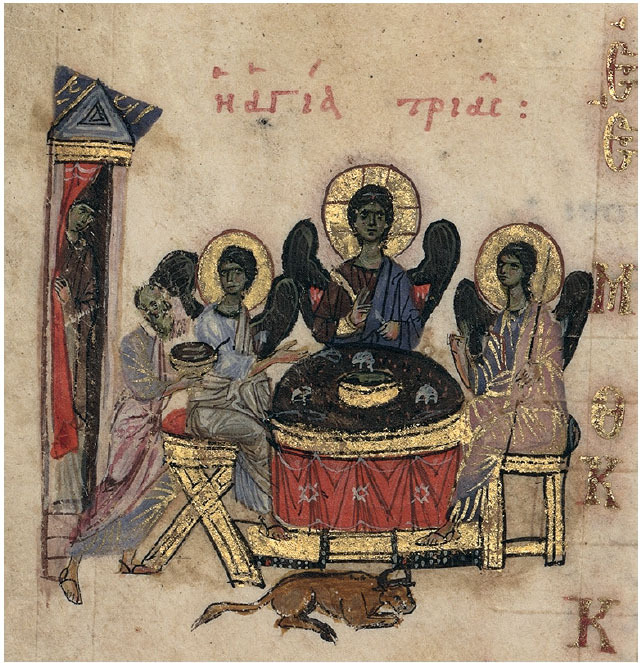 Discussion in 'The Ancient Way - Eastern Orthodox' started by archer75, Apr 15, 2019 at 7:20 PM. 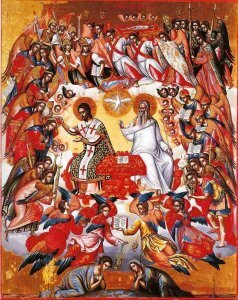 I saw this image ("Divine Liturgy") on OrthodoxWiki. 16th century. This includes a depiction of the Holy Trinity, right? Although now God the Father is generally not depicted in icons, yes? Is there any other way to understand this image? 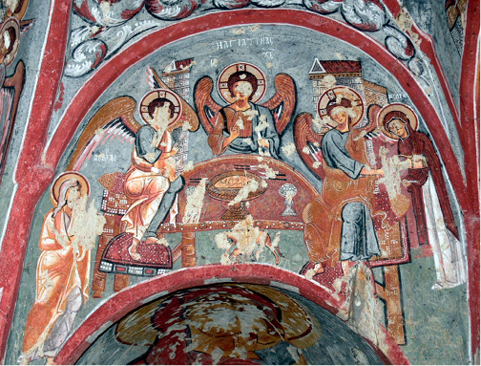 historically, that is not the Father but the pre-Incarnate Christ as the Ancient of Days. Then the figure to the left of the Holy Spirit is...? What am I missing? Or are they both depictions of Christ, incarnate on left and pre-incarnate on right? hopefully the iconographer has both being Christ as you said, since at the Ascension humanity sat down at the right hand of divinity. While I hope what Fr Matt said is true, the depiction of the Ancient of Days doesn’t have the IC XC shown. 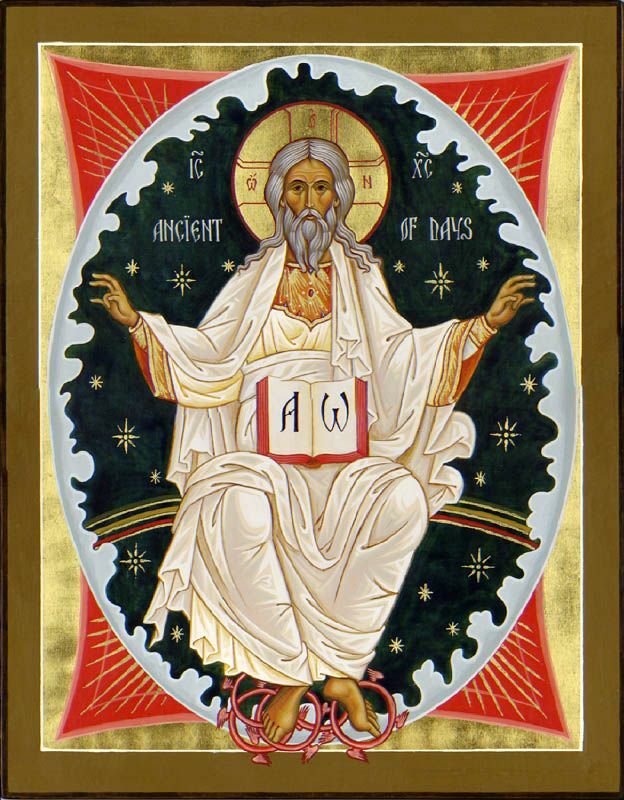 That makes me think that the iconographer was illustrating God the Father as the Ancient of Days. That said - Father is absolutely right that historically the Ancient of Days is the Pre-Incarnate Christ not God the Father. You've posed my question better. I guess I meant to ask if this image might be from before there was a clear rule against depicting the Father, and that the Ancient of Days was Christ. Well, St John of Damascus said the following: "If we attempt to make an image of the invisible God, this would be sinful indeed. It is impossible to portray one who is without body:invisible, uncircumscribed and without form." The Russian Council reiterating this restriction of depicting God the Father was in 1667, so a 16th century icon would be prior to that ruling. It wasn’t a new concept though. I'd have to look through my books to find a better copy of that icon, but it looks like there is a cruciform nimbus in the halo but it is faint. Michael Damaskinos was a very skilled painter who trained with Venetian artists. His work can be very traditional or quite western. This image tends toward the latter in many respects. 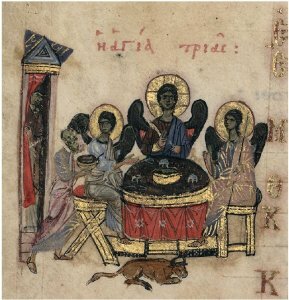 I wouldn't take it as a good example of iconography even though it is meticulously painted and had some very good elements. There isn't much of a precedent of depicting God the Father in pre-16th century iconography. 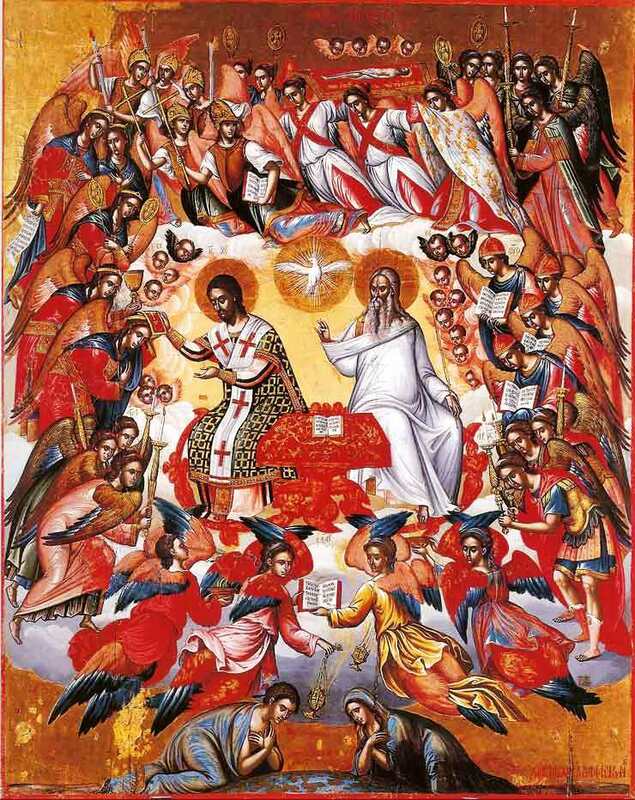 In the 16th century the Ancient of Days icon still used a cross in the nimbus (as the icon in the OP shows) which suggests it's Christ. By the time Moscow (1500) became a center of icon painting the Ancient of Days figure began being depicted with a triangular halo which signified God the Father. Prior to this in Novgorod the Ancient of Days image still sported a cross in the halo. Was the IC XC tradition with the Ancient of Days added for clarification after the council? That is definitely a cruciform nimbus now that you point it out, Fr Nutroll.